Electrical engineer James Lewis stops by to share his insights on the surprisingly complex world of capacitors. Carmen introduces the show as covering “passives.” This refers to passive electrical devices that have no control over voltage, current, or signal gain. Our guest for this episode is electrical engineer James Lewis, a Marketing Director for capacitor manufacturing firm KEMET. 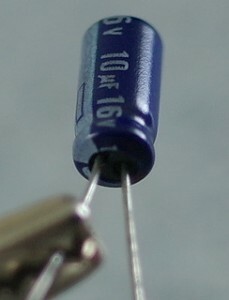 Brian references using “NPO” capacitors, which refers to a highly stable form of ceramic capacitor. James got interested in electronics during high school, when he discovered he could overclock his TI-85 calculator by swapping out a capacitor. Apparently Carmen spent too many hours playing Block Dude on his calculator during his high school days. Our guest became a field application engineer (FAE) upon graduating from college. According to James, a deep knowledge of materials and chemical processes is crucial for developing and manufacturing capacitors. Decoupling: Removing noise (or alternating current elements) from a fixed voltage signal signal. Filtering: Removing unwanted signal frequencies. Wave Shaping: Using a capacitor’s charging and discharging characteristics to create desired waveforms. Coupling: Allowing desired frequency elements to pass from one circuit stage to the next. Oscillation: Creating a sinusoidal waveform of a desired frequency. For a long time, it was widely claimed that everyone should drink 8 glasses of water a day. Now, that viewpoint is much less prevalent. Carmen, Jeff and Brian have distinctly different viewpoints about how a capacitor works. Ceramic capacitors are thermally stable and provide precise capacitive values. Electrolytic capacitors (either aluminum or tantalum) are good for storing a large amount of charge. Film capacitors can handle voltages in excess of 500 volts. Although ideal capacitors theoretically exhibit no resistance or inductance, real-world capacitors are subject to equivalent series resistance (ESR) and equivalent series inductance (ESL). KEMET has a tool called K-Sim which allows designers to view how capacitor parameters vary with frequency, voltage, and temperature. When he was working as an FAE, James encountered problems with counterfeit capacitors at least once a month. Under the heading of “Why did they do that?”, the electronics industry marks the negative lead (cathode) of aluminum electrolytic capacitors, and the positive lead (anode) of tantalum electrolytic capacitors. Supercapacitors bridge the gap between capacitors and batteries. While James is sure graphene will lead to better capacitors, he still waiting for its breakthrough application. EEStor is a company claiming significant advances in capacitor charge density and operating voltages. James mentions the KEMET Engineering Center and KEMET Institute of Technology (KIT) as resources for engineers wanting to learn more about capacitors. A more technically in-depth interview with James about capacitor performance can be found on Episode 25 of the Spark Gap podcast. James publishes instructional videos about electronics on his AddOhms YouTube channel. Listeners can delve into our guest’s writings on his Bald Engineer blog. James can be found on Twitter as @baldengineer. Thanks to Kiran Foster for the photo titled “capacitor.” Podcast theme music by Paul Stevenson.